A good looking little lamp that packs a big Lumen punch! Now available in three sizes to suit many applications. Check size details below in specifications to see what will work best in your lamp. 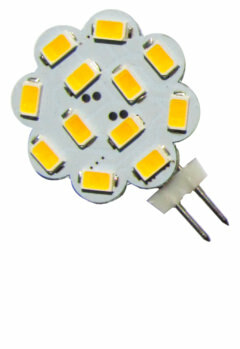 1W, 1.5W and 2W options with Warm White and Medium White available. Lamps reach an astonishing lumens per watt so even the smallest is a very power light source. Cute low energy compact LED lamp ideal for a range of low voltage lighting applications where a good level of light, robustness and long life is required with extremely low energy consumption. 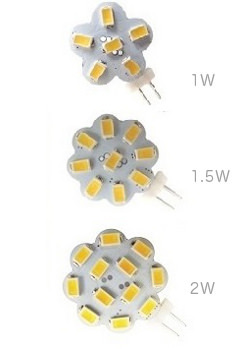 Can be considered a sensible low energy replacement for halogen 10W to 20W. Ideal lamps for ultra-low energy lighting using regular DC G4 capsule lamps for; household, boating and caravanning. SAFETY 1ST... Please ensure the correct rating of cabling is used throughout when installing DC lighting circuits. Long cable runs may require high grade, high amperage cables in order to prevent excessive voltage loss, especially when using multiple lamps on the same circuit. All circuits should be fitted with a suitably rated safety fuse in order to prevent fire in the event of short circuit. Use of proprietary lamp fittings is recommended wherever possible to protect and prevent the ingress of insects and damp where lamps may be exposed in external / exterior light fittings. N.B: All lamps are reverse polarity protected so that there will be no damage if polarity is incorect for your light fitting. Power: Options for 1, 1.5 and 2Watts: Specially developed by OnSolar to be super frugal with three super powerful new breed led SMD5630 devices. Lumens: 1W-130, 1.5W-190 and 2W-252 - YES, that's not a misprint! Operating Voltage: 10 to 30V DC Recomended to use a regulated 12v or 24V dc supply / LED constant voltage transformer. 12 Month Warranty against premature failure.